The University of Sri Jayewardenepura (USJP) invites applications for the B.Sc. (special degree) in Sports Science and Management for the academic year 2013/2014. Applications forms could be download from www.sjp.ac.lk and applications should send on or before 30th June 2014. Tags: B.Sc. 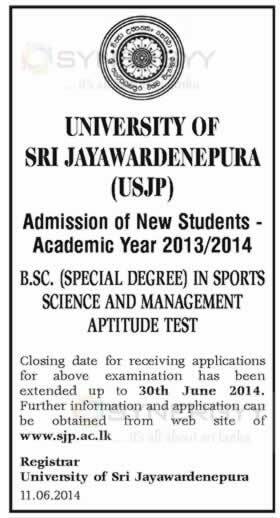 (special degree) in Sports Science and ManagementBachelors Degree Programme in Srilankauniversity of Sri Jayewardenepura.